We have the UK's largest seating after sales department, dedicated to supporting our customers for the lifetime of their seating. The understructure of your retractable seating system comes with a 10 year warranty against manufacturing defect. But we know that our seating will still be performing beautifully after considerably longer than this. We're here to help you ensure that it does. 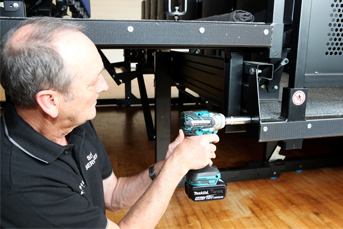 Annual servicing - essential to keep retractable seating safe, smooth and reliable - and useful for all other types of seating too. 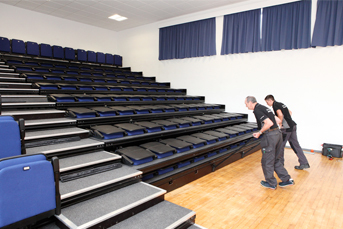 Parts and Call Out Service - whether you just need a few spares (for our own or other manufacturers' seating) or you need an emergency repair to get your venue ready for a performance. Refurbishment - from a spruce-up to a complete overhaul, we can make your seating look good as new. To download our after sales brochure, please click here. You can contact the after sales team on +44(0)1373 865050. For out of hours emergency enquiries, please call +44 (0) 7970 847470.